Use the website resources to organise your own coastal cleanup. We're collating digital, printable and watchable resources to help you plan a successful cleanup and then dump (upload) your rubbish data back onto the site to share with others. Do specially developed classroom lessons for Year's 3-4 and Year's 5-6 in the science and geography curriculum areas. This is a big issue and we're not alone in getting active. Our partner organisations, such as Tangaroa Blue, have excellent resources which we'll use as well. 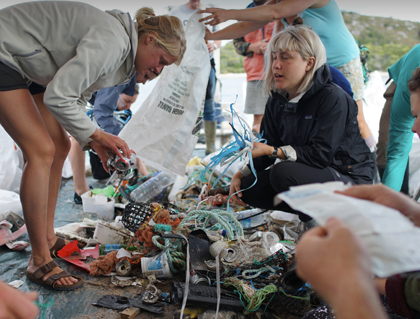 Members of our education team, including Team Clean volunteers, will be able to join some beach cleanups around our home base of Tassie and offer Skype presentations throughout the year to those further afield.